Summer Bucket List for Kids 2018 - Create Memories this Summer! Create family memories this summer with this summer bucket list for kids! Download it for free and check off all the fun activities as you do them! If you are looking for a fun and memorable summer with the kids, this summer bucket list for kids is exactly what you need! Summer buckets lists are great because they help keep you on track. Having ideas right in front of you, means more time making memories and less time in front of a screen. This summer bucket list for kids is a blend of both at home activities and travel ideas. We are so excited to see if we can check all these items off this year! We hope you will join us! 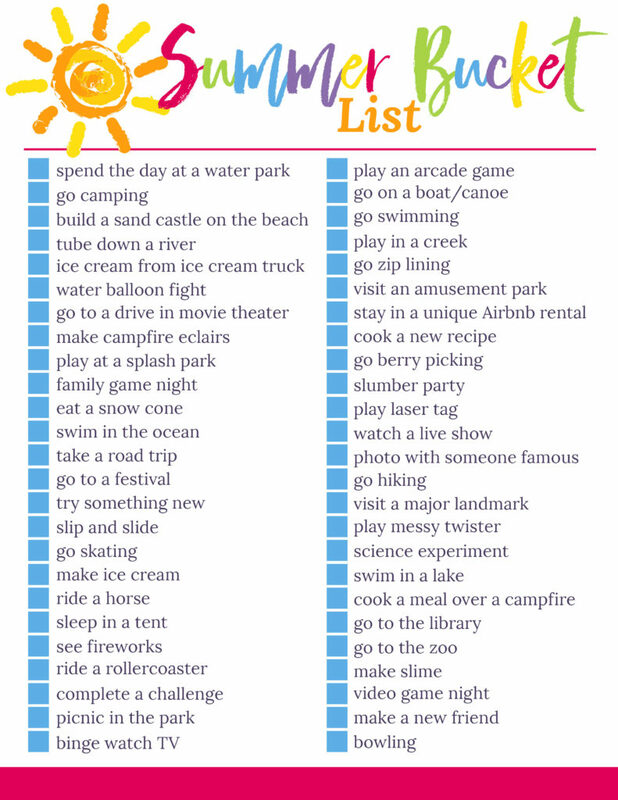 You can print off your own copy of the summer bucket list for kids here or download the graphic at the bottom of the post. 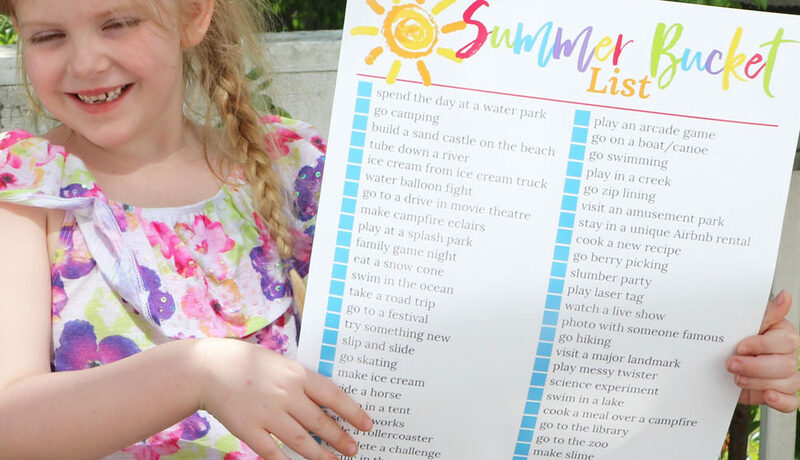 Pin this fun summer bucket list for kids so you have to print each summer! The Summer JoJo Siwa Box is Bright and Sunny! Awesome list! We usually try to make it to a drive in theater each summer, they are so fun! Thanks for sharing! Love this list! will definitely be printing out and checking some of these off the list! Cute ideas! What a great way to not fall into a rut! I agree! Last year we spent a little too much time in front of screens, which isn’t always a bad thing…but we wanted to have a little more of an adventure this summer so we thought this would help! I love this! My son is still a little too young for this but I’ll be pinning for next year! Love this! These are all great ideas. I’ll have to try some of the outdoor ones with my two this summer. We made slime everyday last summer lol. We are doing a lot of slime lately! This is a perfect post for me! It’s vacation time in India and I have got some wonderful ideas from your post. Cute idea! I bet my niece would love having her own summer bucket list like this. This is such a fun list!! I can’t wait until my daughter is a little older and can do more of these things! Kristi Ann, thank you for your blog post.Really thank you! Awesome. This is a GREAT IDEA! I am going to print this off this week! Wow! That’s kind of a list! I’m sure these kids will be busy this summer with all those fun listed. I think I couldn’t add any. LOL! This is the cutest bucket list! I kind of want this for myself, to be honest 🙂 Sounds like an action packed summer ahead! Awesome list! I did a bucket list too! They are great for making sure you pack the most fun into your summer. This is a great list. We try to do most of this, but there are definitely some on here that I want to add. Giving the kids a bucket list is awesome, especially since it keeps them from using too much of their gadgets and lets them enjoy the weather outdoors. Love the ideas that you have here and the printable too! I adore the idea of a bucket list for kids, what an awesome idea. I do hope you manage to tick off all the fun activities! Wow! This is a great list. I really love to these too. This is my kind of bucket list for summer. Thank you for sharing. Thanks for sharing your great list of fun things you can do with your children–such as having a picnic in the park, riding a roller coaster, sleeping in a tent, riding horses, and many more. This is such a terrific idea! I never thought about summer bucketlist for kids. I’m going to do this with my step-son and recommend it to my sister as well! This list is full of such great ideas! We have 2 year old twins, and boy are some of these things definitely on the list. Your site and layout is so nice and easy to navigate. Thanks for sharing! Great list! it will definitely make summer memorable for the whole family! it is so precious! This is such a wonderful round up and it is coming at the apt time because summer holidays are about to begin !! Thanks for sharing this! How nostalgic. It took back in time when we use to spend the summer without technology. Brilliant list! I really need to bookmark this because I know when Summer comes all this will come into play quite well! Oh dear! I can’t wait! Twister is probably something we could all do as a family that’s really fun too! Love this! Awesome list! We would love to share this on Our Page Socialkids for our Mom and dad audience! Thanks for sharing! Feel free to share all you want! Thank you so much! What a list! Wow – this would easily take all summer! Fun list! We’ll be taking some of your ideas for our upcoming summer days! Love the list! And I also love the picture of your daughter holding the list! We plan to swim a lot this summer in Michigan. Great list, keep it coming! This looks like so much fun! I can’t wait to do many of these tasks with my granddaughter!! I am making this my bucket list! Fun, fun, fun. Such a great list and a great way for the kids to get excited about getting out of the house this summer. This is a great list. I would have to change up some things since we live in a rural area and some items would cost quite a bit to get to. This is a great list, I am work g on one with my girls. Going to see what they want to do. What a great way to keep the kids busy all summer! And they will initiate the activity! How creative is this. Your list looks like a ton of fun. This would be a fun activity to get my kids together and do. I think it would be enjoyable to see how their list compared and differed. I have 8 kids ranging from 6-16 years old. Thank you for sharing this fun idea. Fantastic idea. Some of those we can’t do here but I’m going to make one up with most of your ideas and surprise the girls with it during the week. It will make a fun filled and adventurous Summer. Anything’s better than trying to get them off Fortnite! Extensive and fun bucket list for the summer with the kids. Many we will do and some we will have to add to our list for the summer fun. Looking forward. oooh now I would like a water balloon fight!! Some great ideas here because sometimes it can be a struggle to think of enough things to keep children occupied for the whole of the summer! What a fun idea! I hope you get to do everything on the list! This is great! Even though we don’t have kids a lot of these ideas can be used for a date day too haha we are kids at heart. Love that you made a graphic chart of them too! Good ideas! Something like the zoo never gets old. 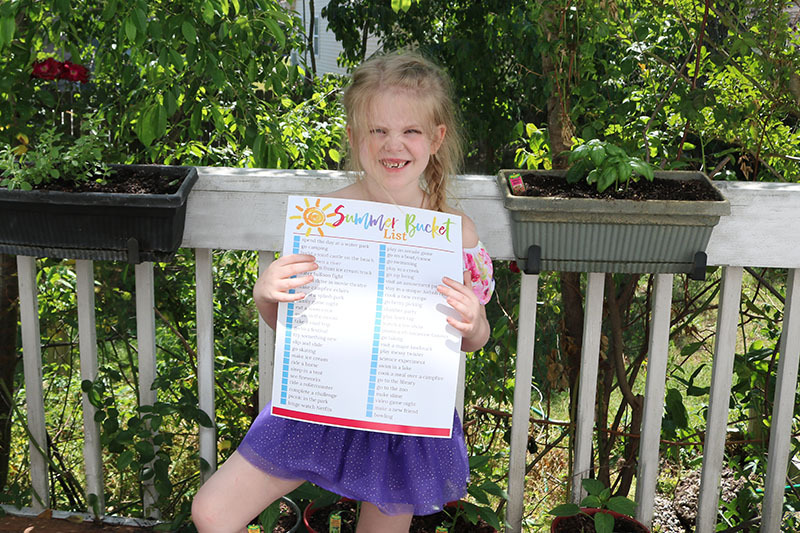 What a fabulous list of ideas to do during the summer! I am going to download that list and make sure we tick off as many things as we can do. We do a summer bucket list too. The kids have a bad habit of saying that there’s nothing to do! So we write out a list and then they have a whole bunch of ideas to pick from when they need some inspiration. These are pretty good list! My nephews been able to create a list for summer bucket list. awesome list! I love summer stuff to do with my kids. The campfire eclairs look fabulous!